He dropped me at my hotel and drove away. Three hours later I performed Bach, Beethoven, Schubert and Prokofiev at the hall down the street. Listen, We Have a Jingle! 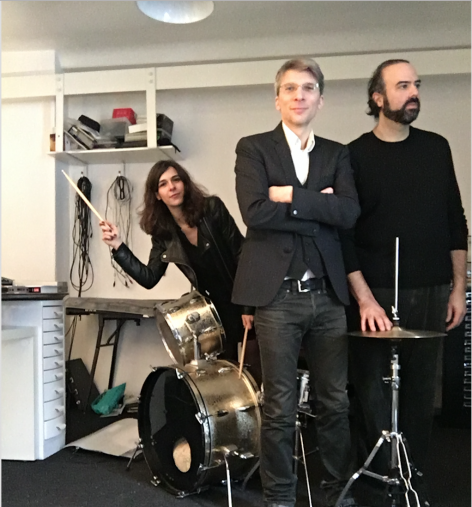 Armen Avanessian visited Ari Benjamin Meyers together with Marie-France Rafael in his studio in Kreuzberg for 60Hz‬. At the end of 60 minutes 60Hz finally has the only thing that was still missing for such an amazing radio show: a jingle, or rather one out of 60 jingles. You’ll hear about Marie’s and Ari’s new book ‘Music on Display’ and his work as a composer, (post)contemporary artist, his upcoming shows, the book launch on February 19th at Spike Berlin, his childhood discovery of Satie and Vexation’s 840 repetitions, his discovery now of our hidden singing talents, and basically everything you ever wanted to know about the history of radio (jingles) and why its frequency should be measured not in hertz but in hurts: Ari explains it all while sitting and playing at his piano. And all this you get if you make it beyond the first 10 minutes of us recording a jingle for 60Hertz (or hurts) totally out of tune. Please, Don't Tell Me I Look Prettier! As much as I dislike passing generalized judgments, one feature that seems to prevail in Egypt’s social life is meddling in one another’s lives, one time through criticism, the other time through subtle or blatant commentary. Being the free spirit that I am, not only have I come to learn how to shun people’s unsolicited opinions but I have also come to find pleasure in defying society in pursuit of stretching my limits and growing. However, despite my thickened skin towards societal blabber, I could never escape all sorts of judgments that accompanied both putting on and taking off my hijab (Islamic headscarf). In contrast to what both schools of supporters and opposers may think, neither step actually left a significant impact on the path I walked. With or without the veil, I was – and still am – pretty much the same person. In September of 2007, I wore the hijab out of complete conviction, backed with a set of unwavering logical arguments. Despite my parents thinking that I was too young and that further on I may find it a burden, I still did what I thought was the right thing to do. It was a step I felt at the time was much needed. In November of 2015, I took off my hijab with a pretty much similar mindset to when I put it on: complete conviction, unwavering logical argument and a deep belief that I needed to take this step. No doubts, no remorse. However, what was also common between the two instances of decision making was the subtle peer and societal pressure which played a core part in shaping my beliefs and feelings, even if I was made to believe that they were intrinsic and genuine. It was upon realizing so that it became a necessity to revisit why I wore the hijab at all. In the years prior to 2007, I saw many girls my age wear the hijab. In parallel, I often heard teachers talk about how big of a responsibility wearing it is and that once you put it on, you can never take it off. Along the same lines, one teacher once told us about the time she decided to take off her veil, which was only followed by a series of unfortunate events. Taking this as a sign from God that she shouldn’t have taken it off, she put it back on. Filled with fear that every single waking day without wearing my veil only meant more sin, I decided it was high time I wore it. I mean, who in their proper mind would want to fry in hell? It wasn’t until five years later in 2012 that I started realizing how influenced I was with society’s perception on wearing the veil. Consequently, I started questioning whether I wore the headscarf out of piety or out of following the societal and religious consensus on the path a girl should walk down. Seeing as how I still struggle with the basic practices of Islam, I felt that I portrayed a false image that didn’t exactly reflect my stance. Opposed by my family at the time, I didn’t take it off. Although I never hated it, I just grew indifferent about it. Hoping to feel natural and at ease in my own skin and in my veil, I started to tweak how I wore it until it eventually looked more like a fashionable rendition of this societal dress code, void of any religious or pious purpose. This indifference carried on, until I felt like I was doing myself and this religious practice – which I have all the respect for – wrong. “You know, mom, between myself and God, I don’t consider myself veiled anymore. Let’s be honest, what I wear, the way I wear it, that isn’t real hijab. As though uttering out my thoughts gave them life and gave me purpose, I ventured for a second round of discussions with my family and, this time trusting that I was taking this step based on sound logic and not an impulsive whim, I took it off. However, in all honesty, I strongly believe that the prevailing trend of women and girls taking off their veil in the past few years had a rather similar impact to the time when I put it on. As certain as I am of the logic which led to me to either step, I will always be a bit doubtful about how much of my logic was purely mine and how much was based on societal influence. Nevertheless, I don’t regret either decision. Although confident of the step I was taking, what left my heart a bit heavy was worrying I would face harsh judgments. As a matter of fact, almost everyone I met was quite accepting of my decision, sparing me any condescending comments or unwanted religious sermons. Strangely though, what made me feel rather uncomfortable was the praise I received. Varying between “You look gorgeous!” and “This suits your lifestyle more,” I knew people were trying to show their support, but they were boiling down the value of the journey to mere external looks. For me, it was a journey of reestablishing my relationship with God, and trying to find Him is what led me to taking off my headscarf – which is only one step among many along the way. Tired of constructing my spiritual life on the fear of punishment, I vowed to only do things out of love for God and the true desire to do what makes Him happy – similar to how anyone would act towards a person they love. But in doing so, I had to take a step back and reevaluate how I practiced the things which we allegedly do for God. I am not against wearing the headscarf but I am against wearing it for the wrong reasons. Having once bet on God’s punishment when I put it on, I was this time betting on His mercy as I took it off. Looking back on the doubts, insecurities and beliefs that I dwelled on, it irritated me that to those who tried to show support, it was more or less a matter of looks. With or without the scarf, I have my good days when I’m all shiny and pretty and I have my days when I’m an utter mess. But guess what, that’s how all people are! In the years following 2011 and in the wake of this aggressive and mutated face of feminism that has swept the country, many movements and public figures called on women to take off their headscarves, those chains that restricted women and kept them from reaching their full potential. Looking at myself and my friends who have worn it for many years and who also happen to be very successful and aspiring young ladies, it was quite entertaining how people generalized their personal experiences and traumas, boiling them down to the hijab and how it’s one means of limiting women – kind of sounds like when feminists wanted to burn bras! But let me tell you what I have achieved during the years when I wore my headscarf. I have graduated both school and college with honors. I started cycling in Cairo at a time when I was called insane for doing so. I traveled to new places in Egypt that I had never seen before and I traveled for the first time on my own to Europe – twice. I took my first steps along the professional career path. I left an impact wherever I worked. I succeeded at some things and failed at others. Fell in and out of love. I grew and the horizons of my capabilities grew farther, always inviting me to go the extra mile. I made new friends, cherished old ones, went through uncountable precious experiences – all of which contributed to my continued growth. If there is one thing I shall miss about wearing my headscarf, it is proving the absurdity of linking the hijab to limited freedom or aspiration. My eight veiled years were exceptionally rich eight years that I don’t regret a single day of. The first time I met Enas was one year after we physically met. We were at a cafe, exchanging words and magic about God and the world, as she descriptively narrated her first solo trip to Europe. Suddenly, I saw a glimmer in her eyes; a glimmer of someone who’s hungry for life; a glimmer of someone who truly knows how to live by the codes of passion. The second time I met her was when she decided to follow her heart and shift careers. I knew that she has a heart that encompasses the world, and following that heart would never lead her astray. I knew she would put her unicorn heart and soul into whatever she sets her mind on, and that’s exactly what happened. The third time I met her was when she shared a collaged picture of herself alongside Marge from the Simpsons. She had the eyes of a child. The way she saw the world anew everyday has inspired me to write: “May you grow up enough to become a child”. That was when I envied her for having the soul of an artist and the mind of a world conqueror who grabs the world by the neck – a formidable combination if you don’t know. The fourth time I met her was when she she decided to give it all up and chase what she loves, when her detachment of all things seemed courageous and thrilling, exactly like her soul. You will meet Enas on one level or the other, whether she brings you to your knees by singing, melting your heart by casually playing Chopin, or flipping through her thoughts like an eloquent book, and never hesitating to tell it like it is. But if you’re really damn lucky, you’ll meet Enas on a personal level where her existence strips you off the masks you think you need to wear. She is magic. Not the representation of it, she is it. You only need to meet her once to know that, but one time, mark my words, is the furthest from enough. She is art, one that cannot be unseen. 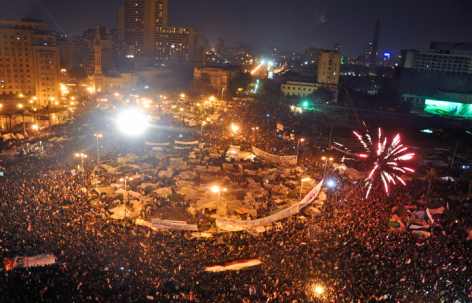 Tahrir Square on Feb. 11: Hosni Mubarak had resigned after 30 years in power. 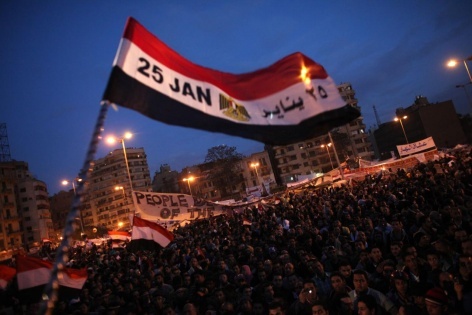 It was the day of the fifth anniversary of the beginning of what would become the Tahrir revolution, one of the first episodes of what would become the Arab Spring, one of the most promising events, a series of days really, 18 say the people who were there. And Nora Amin was one of them. There are still sparkles in her eyes when she talks about these first 18 days, and her voice changes when she talks about what happened then. She has written about all of that, a very moving, a very important text, especially today in the context of all the hysteria, the wrong information, the lack of knowledge of what really happened and what it meant. 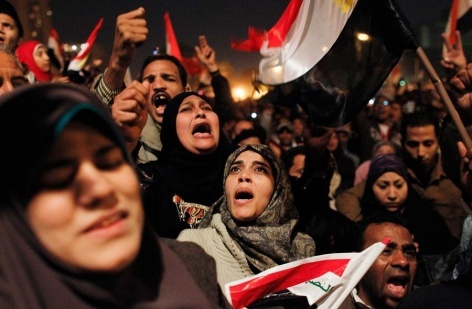 “Migrating the Feminine“ is a fearless attempt to find an answer to what it means to be a woman in a society full of prejudice, contempt, anger and transgression against the female, in all ages, in all forms, from the way a young girl is treated to the violent and traumatic events of Tahrir. Nora Amin`s text is personal, passionate and political, her voice is strong in a time full of confusion, her vision is clear, her language as vibrant and as poetic as it can be. This is an important text not only for the Egyptian society, it is part of larger discussion among writers, thinkers, feminists around the world. Amin’s essay “Migrating the Feminine“ is the first book published from the exceptional and experimental collaboration between 60pages and some of the most important journalists, activists and writers in Egypt today. In her interview for 60Hz we discussed the legacy and the sadness involved in the memory of this day, five years on. This may sound a bit emotional, but I’m happy you exist. I am anyways, but especially am right now. When I write to you, it’s like I can beam myself out of all the insanity that I’m surrounded by on a daily basis. And I, like so many others, am suffering from it. People are talking about emigrating. For some people it’s just party talk. Others mean it seriously. On the other hand, this letter beams me back into the middle of everything that’s happened in the weeks since I last wrote you. Is it still the same country? I don’t recognize the politics; I don’t recognize my colleagues. I can’t remember ignorance, meanness and resentment ever being bound together into such a hysteric, roaring bundle as quickly as they were after January 1st, 2016. At the same time, I always have the feeling that I have to tell you something: Aman, be patient with me, I’m a European. We enslaved the world, but those were either my ancestors or, to a much larger extent, the British, the Spanish and the French. And we Europeans of today, we Easyjet-setters, are a strangely spoiled brood — we only know the stories of war and a life of affluence. And a certain inexperience of the world is indeed actually one of the reasons for the excitement, for the political smear campaign, for the anti-constitutional suggestions, for the sheer opportunism that many are escaping into as if a new regime is already visible on the horizon and it’s about to be payday. Another reason may just be racism. Refugees and “people with immigrant backgrounds” are no longer allowed to enter public swimming pools?! Refugees have to forfeit a significant portion of their money?! Mali is a safe third world country? Refugees have to wear a red armband, otherwise they won’t receive any money? The fact is, the people talking about the compulsion to integrate are the ones doing everything to make this integration difficult — mistrust, measures saying families cannot follow, and then lamenting that only “young men traveling alone” are coming to Germany. It really is insane. 2015 was stressful. 2016 is insane. And the panic is growing, especially among the so-called people’s parties. The radical right-wing AfD (Alternative for Germany) party could supposedly receive 10 percent of the vote nationally. There are elections in March in some German states. And since one of the promises of salvation of the old Federal Republic of Germany was a stabil ‘party landscape,’ as the saying goes – Landschaft (landscape) is a very German word – that’s why this shift, which is a pretty unsettling shift among the old constellations, is almost a cultural breach for many. This is the climate post-Cologne. Hardly anybody is talking anymore about the reasons people leave their homes and become refugees. The vast majority will only discuss the need to close borders, right now, unconditionally. They don’t talk about how to do that. They don’t talk about whether refugees, who still want to come, should be shot. They don’t talk about how Europe wouldn’t exist anymore, because Europe, this Europe, the one that wanted to put war in its past, is based on the free flow of people and dissolution of borders. That seems to be all the same to you. You would rather talk about the return of the nation state, because you see what happened in Cologne as a failure of government. But a lot of people are quite gladly discussing the state now, which on the one hand is typical for this country, a country that has sought its fortune or better said misfortune in submission to authority; and on the other hand it’s cynical, because this call for the state, a strong state, often comes from those that wanted nothing, more each and every neoliberal day, than to get rid of the state wholesale. But how does one come up with the idea of the nation state being a solution for an epochal phenomenon, like global migration? It’s obvious that they want to export weapons but that they don’t want to import the people that are fleeing the wars being wages with these weapons. But that won’t succeed. Because then they’d have to sacrifice everything that makes Europe what it is, at least constitutionally: freedom, equality, fraternity. And yes, you probably see things differently, they way my friend, Pankaj Mishra, does. In his book, From the Ruins of Empire, he analyses the West’s lies and crimes during the colonial period, drawing a connection between the democratic aspirations of countries like Iran, Turkey and China and interventions by the West. His conclusion is that Europe created an unjust world, which is now fleeing back to the origin of this evil by a devious refugee route. This is the sentiment behind what you quoted from the Zizek text. It’s one of the must unpleasant thought patterns, because it really is so reactionary, that’s currently making the rounds: Accordingly, egoism is the essential nationalistic kit, ethics are just for the good days, responsibility is for dreamers and humanitarianism is accordingly an episode in the European monotony. They’re riding with their backs to the sun. They’re reversing the course of history — this is their hope. However this plan won’t work, because in doing so, they’re taking away the breathing room. This is the danger. They detach Europe from the rest of the world. By trying to protect Europe with walls, with border fences, with boats in the Mediterranean and with arrangements with dictators like Recep Erdogan, they’re actually destroying it themselves. Because the 21st century is the century of diversity. The culture warriors here don’t want to accept that. They rather spread the image of a murderous Islam, which automatically turns men into rapists. They rather fuel prejudice and hate, producing contempt for the democratic system. They’re acting like liberals, feminists and progressives, of all people, are to be blamed for what happened in Cologne. They’re truly ignorant. And sometimes I really can’t believe my eyes when I read some of the things they’re writing. And sometimes I have to question everything I thought about certain people. Or about people in general. And this, to say something positive, has something thoroughly good to it. It’s a real reality check. And this is what you’re talking about. It’s what’s happening in the world. It’s the “agonistic intimacy,” which is what so many countries and cultures are made of. And yet, Europe has a strange phantasm, that of national homogeneity, something that’s hard to comprehend on a continent that’s been plowed through over and over by mass migrations. But maybe that’s exactly the fear that resurfaces in moments like these. A historian just compared the current situation to the fall of Rome. Comparisons are dumb for the most part. This one was too. If the Romans had voted on it, would it have changed anything? If they had debated it? In the current situation, and this is what your question is getting at, it would certainly be difficult to hold a referendum for one thing. And I also don’t think that’s necessary. The essence of representative systems is what the people express by voting. I’m not an absolute advocate of this system. But it has its advantages. It currently guarantees a modicum of stability. Does Angela Merkel need to communicate differently, speak differently? Could she? Yes, with certainty. Parliament is the place for such a debate and it’s symptomatic and incorrect that this place is no longer being used. The problem with the entire discussion is that it’s being held in such a defensive and fearful manner. But a few days ago, I saw how Justin Trudeau, the Canadian prime minister, casually and self-evidently explained why he took Syrian refugees into his country and why diversity is the future. And in Europe? There are politicians, from Poland in this case, that are seriously saying that vegetarians and bicyclists can not be allowed to be in power. Aman, beam me up. Sometimes I really don’t know what I’ve lost on this continent. 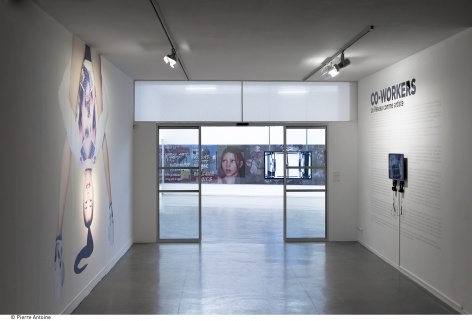 Marie-France Rafael about "the artist as prosumer"
Huge sliding doors dominate the entrance to the exhibition CO-WORKERS – NETWORK AS ARTIST, like the doors we are used to see at department stores. Toke Lykkeberg is standing in front of the moving glass planes. He is one of the curators of the show, waiting to be interviewed by M, an art historian. – can you tell me more about it? The show starts with doors sliding open. There are a couple of other sliding doors in the show. This is part of the mise en scène or scenography that DIS has been in charge of. The many transparent and reflective surfaces lend the show a certain lightness so visitors sort of float through the space. It’s like a space of flows of images, of data in a networked world. But it also reflects life in airports, malls, Apple stores and Starbucks. I know this mise en scène might recall ethnologist Marc Augé’s non-places. In the 1990s, in the wake of the introduction of TGV or Trains à Grande Vitesse, he was interested in a new kind of solitary passenger who left places behind at high speed. But DIS has been more interested in the connected and social individuals who linger, meet up, chill or work in environments with good wifi that has a ubiquitous rather than transitory quality. Places are not negated but rather mixed. So it’s a world in which many divides seem to disappear like the barriers between work and leisure, private and public, commercial and non-commercial space and what is inside and outside, for instance of a museum. The show discusses the divides between what we once called ‘the virtual’ and ‘the real’, between nature and society, the biosphere and the technosphere, East and West, and many other such binaries that no longer work as opposites. Toke and M pass through the sliding doors, that produce a muted but peculiar sound each time they open and close. The couple walk into the first room of the exhibition. The large and elongated space is lit through a skylight in the ceiling. A range of artworks unfolds. Each of them represents a discrete artistic position, but their arrangement spurs a dialogue between the works, and configures a heterogeneous unity of different media and materials. The display of CO-WORKERS makes me think of Dan Graham and his work. Is it a kind of Dan Graham 2.0? If 2.0, then I would say: yes. Dan Graham’s work is a reflection on and of the ‘modern’ world and its modernist architecture, but Co-Workers is not discussing the concept of the ‘modern’ world in general. So CO-WORKERS is about the contemporary world? What would you say – in what kind of world do we live right now? Of course we wanted to create a show that reflects what is around us. While working on the show we realised that our surroundings were changing while we – and many others – were studying them. The problem with art called contemporary is that it is more fleeting than ever. When things accelerate around you, it is very difficult to be contemporary or ‘with time.’ We’re rather out of time. M looks around at the different works of art. She focuses on a cubic construction in the middle of the room. It is made of glass and steel, forming a space within the larger space of the exhibition hall. Inside the cube there are three flat screens, a work by Cécile B. Evans, accompanied by a fish tank by Aude Pariset and Juliette Bonneviot and a workplace curated by Felix Burrichter. The art historian points at the cubic construction in the middle of the room. … which seems to be open and closed at the same time – a space floating inside another space. It reminds me of an aquarium, can you please say something about that? The glass box traversing the space mimics an open office space. It is a transparent barrier. While it divides the space, it also emphasizes the flow from one space to another. We wanted to give each individual artist, group or collective his, her or their own space, but we did not want to cut it off from the rest of the show. Today an artist stands out as an individual, but at the same time as part of a network. They are ‘networked individuals.’ Sometimes you cannot tell one work from the other. The works are shaped by overlapping yet personalized networks. It is almost impossible to separate the part from the whole, the individual from society, they constitute each other. Bruno Latour explains this idea in the following way: If you want to check out a person, you google his name, for example ‘Bruno Latour’. The more links you find about Latour spread out across the Internet, the more he comes together as a person. You might feel you loose yourself in the network, but it might also be where you resurface. Do you think this is an aspect of our contemporary world – gaining something by losing parts of our individuality? Douglas Coupland says somewhere in his recent writings: „At the moment we don’t know which will triumph: the individual or the mob. It might be the biggest question of this century.“ My answer to the question would be: both. The individual might only reinvent itself, if it gives in to or adapts to its surroundings. You can only shape an environment that you are a part of. By resisting today’s world or simply keeping it at a distance, you don’t change its course. To a certain extent, you might rather have to lose a bit of control in order to regain influence. At least, many artists in the show work along these lines. Parker Ito, for example, creates images that are meant to be photographed by others. Toke turns to a series of large format pictures. Each part of the series seems to be composed out of different images, drawings and written texts superimposed on each other, in a somewhat raw manner akin to graffiti. Yet, the pictures are framed with a silky and highly brilliant material that lends them the touch of a glossy magazine illustration. The reflector fabric on which he has printed the images are hypersensitive to the faintest change in the light. So depending on the light, the angle, your camera, every photo of his work will be somewhat unique. Parker wanted to make an ‘undocumentable’ work that triggers a multiplication of images the moment it is documented. The work taps into and prolongs a network of images. Toke takes his mobile phone out of his pocket and points it towards the pictures. He turns flash on and pushes the release button. And indeed, the colourful pictures on the wall suddenly turn black and white, as if they are loosing all their colours when hit by a bit of light. These pictures seem to have lives of their own, changing and never being the same again. The whole exhibition in general somehow reminds me of a living organism, which can be likened to a network, doesn’t it? Yes, it might be troubling that something has a life of its own. An oft-heard critique of contemporary network theory is that the individual, the human subject is without power. By reflecting on these networks we might however empower that disempowered individual to impose itself in the networks. Following your definition of network, one could think of an organism? If you want things to circulate in a network you need mediation from one node to another. This mediation might be undertaken by an intermediary or a mediator. In the case of the intermediary, there is no transformation of content from one point to another. However, when an image travels from an exhibition space to a camera, to a computer, to Photoshop, to Facebook, to Instagram and ends up as a bad quality print, there’s transformation. There are mediators translating the image so information is both lost and added. Artists work with such mediators in the same way they now work with bacteria, animals, plants and so on. So I’m also interested in networks at the intersection of bio- and technosphere. Toke and M step into the cubic construction and sit down around the workplace layout. Keeping this gain of loss of information in mind, can you tell me something about the rematerialisation of the art object? It goes back to Lucy Lippard’s idea that conceptual art of the sixties and seventies was a dematerialisation…. … in favour of the information, becoming the immaterial? Yes, you might call it the ‘Helvetica ideology’, following the idea that you can create a form – in this case the Helvetica font – that is so transparent you only get the content. In the course of the democratisation of telecommunication in the sixties and seventies people started to communicate across long distances with ease. They were preoccupied by the feeling of talking with a person without being in his or her presence. So this development was experienced as a disembodiment, a dematerialisation. Some artists got into telepathy, thinking about how they could make thoughts travel from one mind to another without taking on a material shape. Materiality was secondary to the content and ideally you could have pure content. That continued with the way the Internet developed in the nineties. However, with Web 2.0 it became social and now with the ‘Internet of Things’ the virtual and immaterial is evidently embedded in the real and material. So both can make us understand how things rematerialise rather than dematerialise while circulating in the network, but also how the network works and how it is constituted. In a way, we’re not only looking at who is walking around the house, but also looking at the house itself. That is an interesting metaphor. Is this exhibition the housing hosting what is in that larger house? We are trying to present images, objects and information that recall the images, objects and information that are around us, but also their surroundings. We both want to present the artworks and the environment in which these artworks make sense. Toke and M continue walking through the exhibition. They pass by the work of Timur Si-Qin, The Struggle (2012), an installation made of four apparently excessively designed pedestals on which Nike gym bags are hanging. Each of the bags is filled with stones and water bottles. Finally the couple stops in front of a gleaming installation, a cubic box lit by neon lights. On its backside is an image of a boy, which is reflected by a glass surface installed behind the cubic box. Please tell me about this work. It is a work by the French artist David Douard, called The reason we no longer s’speack. Slipper of snow (2015). It is an image of a boy that Douard has reworked. His eyes have been erased, the boy’s hand is almost inside his mouth. In a way, right now, I can’t help thinking of The Thinker by Rodin. Rodin got the motif of the thinker from the Last Judgement fresco of Michelangelo, in which one man sits bent over, encircled by the flames of hell. Rodin isolated the figure in his sculpture from any surroundings: The individual suddenly is left alone with his or her troubled mind. This is the modern man. 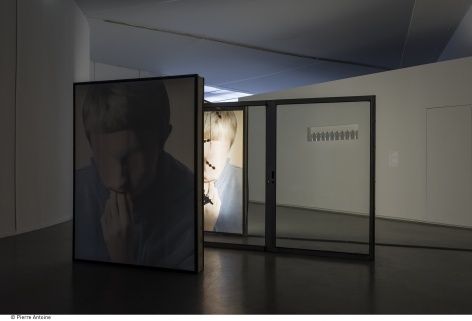 Douard’s contemporary speechless version is a reflection in glass in two ways: A boy is reflected in the glass in the midst of reflecting on himself, withdrawn into his own world. Maybe Douard presents an image of someone in the Internet age who has the possibility to reach out for information anywhere, but ends up trapped by what he’s already into. Today, any new search query is biased by an older one and, as a consequence, one might get caught up in a so-called filter bubble. So a network culture also creates certain disconnects. Would you say that this work is framing a critique of the Internet based society? I would personally not use the word critique. It implies looking at looking at the world from the outside. But an artist is always more engaged in the world through his or her work than the critique teaches us. I’d rather say that Douard’s work evokes the pains rather than the pleasures of network culture. So it is more a reflection on the state of things? It is an attempt to understand an aspect of a networked world. If you do not feel a certain pain looking at the work, I am not sure you’re on the right track. I am against dividing works into categories such as affirmative or critical. Most works are both. As they continue, Toke and M find themselves in a room whit a video work by Rachel Rose – Sitting Feeding Sleeping (2013). This visual collage shows images of animals that the artist took in different US-American zoos, as well as computer screenshots and iconic paintings from art history. 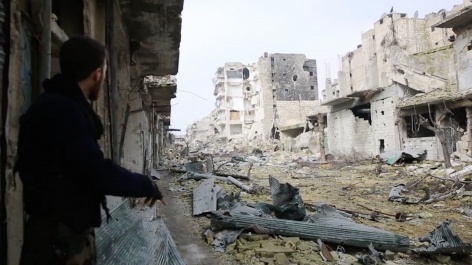 The saccade rhythm of the video is alternating with more contemplative sequences, conveying a strange feeling of detachment, which is even more accentuated by the alienating computer voiceover commenting the images. For a few years, there’s been a discussion concerning the question whether we should slow down our lives or adjust to the speed of information technology developing faster and faster. What do you say? 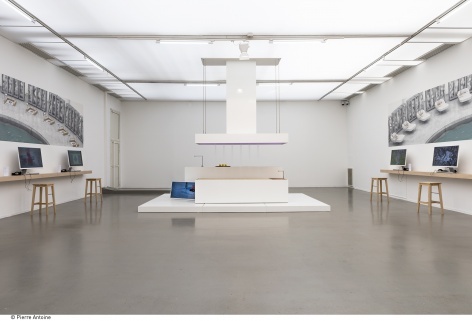 Is the exhibition a comment on or even a contribution to that discussion? About ten or fifteen years ago the French artist Pierre Joseph said: In order to understand how a car works, you have to take it apart. But artists today rather get inside the car and drive it. If we understand the world as networked then there is no outside anymore. Artists are less interested in utopias and more in the potential of the world we inhabit. We should accelerate some things, others we might slow down. But I don’t believe in history given in advance, i.e. that there is a certain goal to reach at the end of the journey, therefore I am not sure what it might mean to speed up the process we are in the midst of. So taking up your metaphor of the artist as a car driver, you understand an artist today as what you call a prosumer: a producer and consumer at the same time. Yes, that’s another dichotomy that I would like to mention as example of the end of the great divides, namely production and consumption. What characterises the artist today is that he is a prosumer to a certain extent, part of a network where production and consumption are difficult to tell from each other. So today I see artists more as mediators or prosumers. Toke and M reach the last room of the exhibition and stop in front of a work by the collective DIS. The Island (KEN) (2015) resembles at first glance an ordinary, white coloured kitchen in IKEA design. One notices water coming down from time to time from an object that might be mistaken for an exhaust hood. Close inspection reveals it works as a shower. The Island combines the social space of the kitchen with the private space of the bathroom – thus creating a scene in which anything can happen, production and consumption becoming one, and the spectator an activated mediator himself. We met at a café not too far from where it happened. José Lira was calm, composed. He is an architect who has been living in Paris for a few months, working, learning, changing. He is good-looking, he has a beard that is well-trimmed, he seems like somebody you could meet anywhere from Bogota to Beirut, from Bangkok to Bejing. This is the 21st century. But not everybody agrees. Or: What are the reasons, exactly? There was a lot of talking and explaining, some go very far back in history, as far as the 19th century and the story of colonalism and oppression and exploitation and humiliation and broken promises of the West. Some go to the banlieues of Paris. It is all good, it is all important, connecting the dots. But José’s story is different. He just was there. And he wrote down, what he had seen and felt. This is his account: Read it. And listen to the conversation we had. “These are the times when we are at a loss. We don’t know what to do, what to think, I don’t know what to say, but many friends have written to me, concerned, all the terrible news coming from Paris are amplified through the distance, also thanks to the awful tone of news media, resounding with a public that likes tragedy, blood, fear. There was even someone who made up that a Brazilian architect had died in the attacks… I write to tell you that I am well, and to share a little bit of what I am feeling. Perhaps this might help you and me think some more, perhaps feel more closely what happened. I still have not been able to read much about what happened, and I confess that I am shocked by the way the news are treated, in a way that is sometimes too abstract, sometimes too sensationalist. The fact is that I cannot forget the fragile but serene gaze of the victims by my side yesterday evening. “I had spent a blissful Friday afternoon in the company of two former students from the School of Architecture at the University of São Paulo; soon other friends, almost all of them Brazilian and architects, joined us. We decided to have dinner at the Petit Cambodge, a delicious restaurant, in a vibrant, youthful part of the 10ème. At around 9:30, when we were almost done eating, the shots began. We were eating at a sidewalk table, the sound of the machine-gun was very close to us, I saw sparks on the other side of the sidewalk. I swear I first thought those were fireworks, perhaps part of a performance in this neighborhood so full of artists and irreverent people, and I thought it was odd that everyone got up and started running. How extreme! But the shots wouldn’t stop and began to hit all the dishes and bottles all around, and impulsively I joined the flow of people who were running from the restaurant to a grocery store next door. Once in there, I realized that only two of my friends were there; we didn’t know where the other five were. Back inside, there were about twenty of us, and no one had any idea about what had just happened. One of my friends was bleeding, perhaps from glass shards on his forehead. “Ten minutes later, the firemen arrived and we left; then came the police, as always truculent and insensitive. The scene was indescribable. A Holocaust at the level of those back in the day in Cambodia. I didn’t know where to look, there people on the ground, groups of friends comforting the wounded, people crying, some people already dead lying alone, others almost dying. We were looking for our friends. I saw one of them on the ground, assisted by her French friend, also covered in blood. I approached her. A beautiful young woman, her body so small, her skin so fine, very wounded, who spoke to me serenely in Portuguese: “I need to get out of here, I need to get to a hospital.” We tried to comfort her, to embrace her, to stay by her side while waiting for the medical help that had not arrived yet. The firemen helped her with oxygen and a blanket, but they did not know who needed the most help, they did not know what to do. 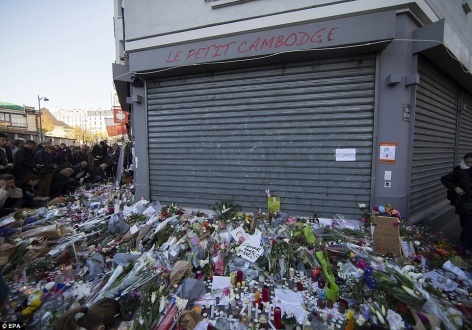 “I will not get into this issue now, but it is very strange to see so much security, so many military and police on the streets of Paris, and so little preparedness to deal with the eventual victims of what they most fear. I will not get into this, because I just want to tell you that what really concerns me, and increasingly so in life, is the feeling in the singular, the pain in the singular, people in the singular. Something so hard to convey, to share, as we know; and also (and not only) for this reason so ignored by the analyses, the news, the leaders, their technicians and technologies, by the aggressors, by people and groups, accustomed to speaking of tens, of hundreds, of thousands. I don’t speak of their personalities, of whether they are intelligent or not, cool or square, happy or not so much, successful or frustrated. But I speak of their bodies, their pain, the look in their eyes, their frailty, their smallness, our skin that tears so easily, our bones that break, really, our organs that sometimes fail, our breathing, labored sometimes. Our voice that murmurs, whispers, whines, talks, asks for help if needed, when possible, our bodies which collide, can’t move, can support other bodies, comfort them, protect others at risk, run when threatened, our kind of automatic reactions that proclaim all the time: “I want life,” I want to preserve life, this potency of feeling, acting, thinking. So brutalized today.